The primary operations area for this shakedown cruise is shown in white. The southern contingency area is shown in red. Both polygons lay completely within the U.S. Exclusive Economic Zone. Multibeam bathymetry shown was collected as part of the Atlantic Canyons Undersea Mapping Expeditions (ACUMEN) project. Image created using Google Earth; courtesy of the NOAA Office of Ocean Exploration and Research. Download image (jpg, 77 KB). From May 13 – June 6, 2013, NOAA Ship Okeanos Explorer will be conducting operations off the East Coast of the United States. For the first four days of the cruise (May 13 – May 17), operations will focus on testing sonar, navigation, and mapping data collection. The remainder of the cruise (May 18 – June 6) will involve testing of a new remotely operated vehicle (ROV). This cruise marks an exciting milestone for the NOAA Office of Ocean Exploration and Research with the unveiling of our new ROV that is capable of diving to depths of 6,000 meters. With this new vehicle, the Okeanos Explorer program will be able to access the vast majority of the seafloor, joining an elite group that can reach all but the deepest of the world’s ocean trenches. The new ROV has been years in the making and is truly a high-quality ‘made in America’ product. Previously, the Okeanos Explorer program used the Ocean Exploration Center’s ROV, Little Hercules, which was on loan to the program for the past few years. Little Hercules is now on display at the University of Rhode Island Graduate School of Oceanography in their Ocean Science and Exploration Center. 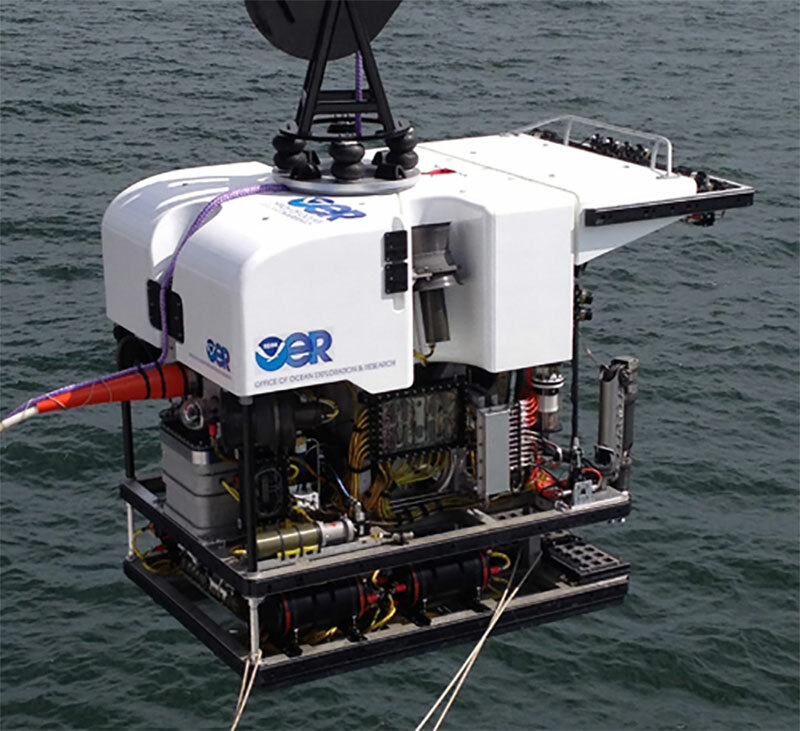 Little Hercules is a 4,000-meter-depth-rated ROV, with an impressive past. Little Hercules was removed from the NOAA Ship Okeanos Explorer after three years of service that took the vehicle to Indonesia, the Galapagos Islands, Panama, and the Gulf of Mexico. Along the way this "little robot that could" captured some of the best underwater video of some of the planet's most spectacular natural landscapes from some of the most remote and hostile places in the world. The new 6,000-meter ROV has more sophisticated capabilities than Little Hercules, and the increased capabilities will enable innovation through research and development of new sensors and systems. The new ROV currently includes hydraulic manipulator arms for deploying oceanographic sensors, an inertial navigation system, a Doppler velocity navigation system, and a system for dynamic lighting control. The new ROV being lowered to the water for a dive. Image courtesy of the NOAA Office of Ocean Exploration and Research. Download image (jpg, 115 KB). For 25 days this May and June, we will run the ship’s sonars and ROV systems through a strategic series of engineering tests. With a system this complex, there are typically some glitches and gremlins that need to be identified, fine-tuned, and worked through. It takes engineers from multiple disciplines to “shake down” a system like this, so we will have mechanical, electrical, and software engineers sailing on the shakedown cruise, as well as video broadcast engineers, data managers, and telepresence engineers who will work together to ensure that all systems are integrated and functioning properly. During a shakedown cruise, the ROV engineers will need a range of seafloor bottom types to test all the ROV’s different systems, and fortunately, the Atlantic Canyons provide just that. In a relatively small area, there are diverse seafloor habitats and bottom types ranging from very flat areas at the base of the canyons on the continental rise to valleys that provide very complex terrain with steep slopes. The ROV engineers not only have to be experts in their respective field of engineering but they must also be able to pilot the vehicle and rebuild portions of the ROV if necessary. Working in the Atlantic Canyons will also provide a good opportunity to prepare for two exploration cruises in the area scheduled for July and August. We will use this cruise to do a little prospecting for areas that will be of the most interest during the later cruises. We invite everyone to watch along in real time as we work out the kinks and bring this state of the art exploration vehicle online. Data reports will be available on the OER Digital Atlas after cruise completion.